K100-forum.com » Off Topic » Humor » Wanna lift mate ? I have decided to replace my leaking rear main seal / clutch "o" ring. Having watched workshop videos where the mechanic works whilst standing up. I convinced myself I needed one of those . Unit arrives, shockingly heavy, which is good I guess, wheeled into position and stabilising legs screwed down. 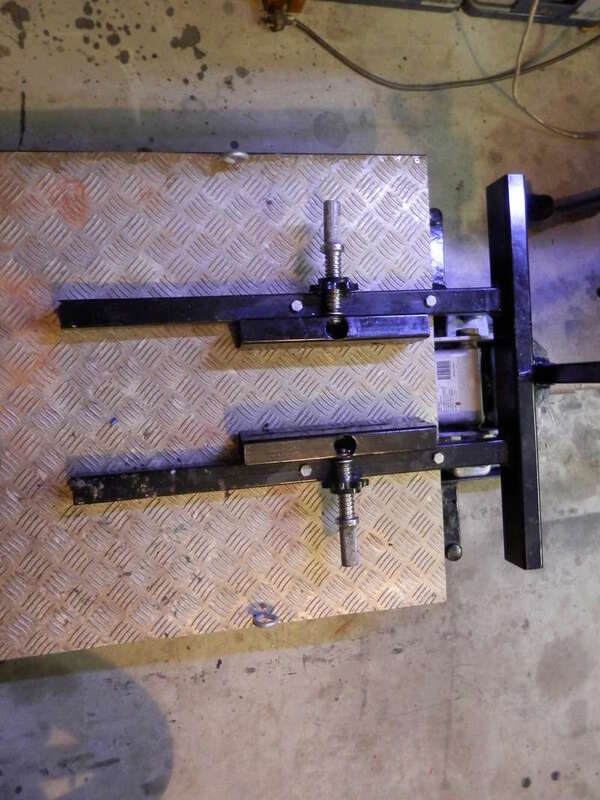 Suddenly, I realise that the bike cannot be pushed up the ramp, so with my partner at the ready to clamp the front wheel , I carefully power the bike up the ramp and onto the table. 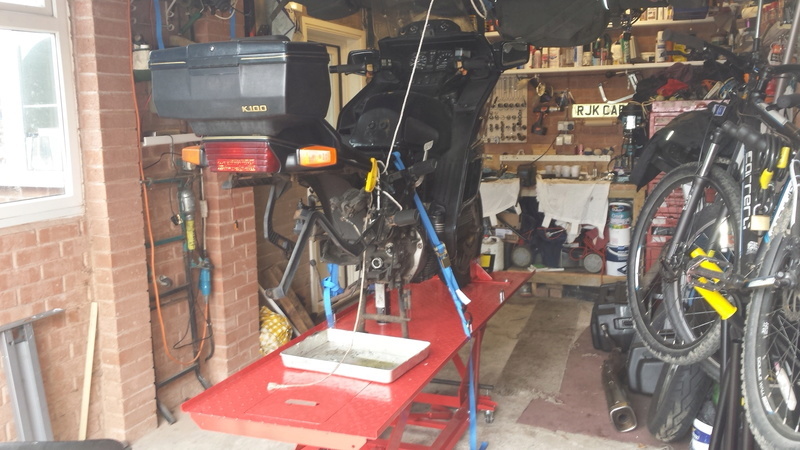 Partner clamps the front wheel and then helps to keep the bike stable whilst I get off and put her on the centre stand . 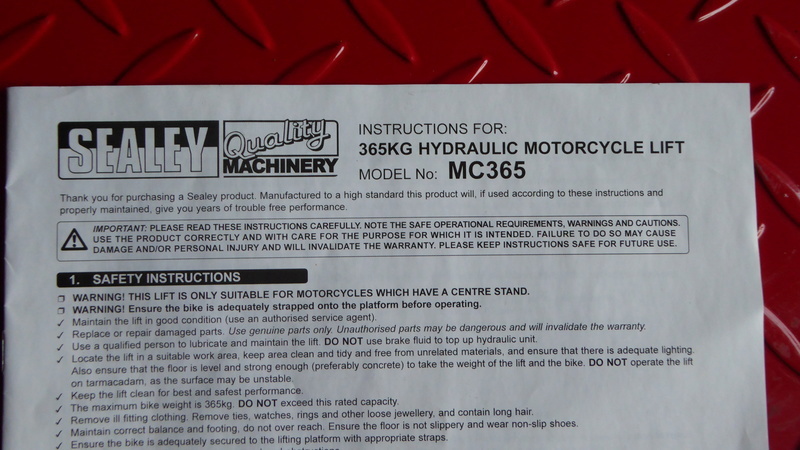 Obviously missed the point in the instruction manual that says " you will require several strong pit crew to assist in the loading of the motorcycle ( unless its a honda 125) . Joking apart. I felt really nervous riding her up the ramp. There is a point where I am on tip toes at best. The table is just wide enough to get your left foot on to use the centre stand. If the hydraulic lift arm was positioned higher, the unit could be set into the floor making it easier and safer. Was much nicer with the bike higher up. Managed to get the exhaust off. I need to replace three studs, and one which snapped. But where are the exhaust copper gaskets ? I know I should have gone to Spec savers. perhaps the PO should have gone too. Hopefully will be back on the road soon. @audibob wrote: But where are the exhaust copper gaskets ? I know I should have gone to Spec savers. perhaps the PO should have gone too. Shine a torch up into the exhaust ports - chances are the gaskets are compound and not copper, so at this point they'll be the same colour as the cylinder head. Get in with a screwdriver and hook them out. You were right of course, though not the easiest things to get out. Pictures of the lift would be appreciated. Pictures as requested Martin . "This could have gone horribly wrong..."
I acquired one of the below to work on my k's but found it totally unsuitable. Once I got the bike on the ramp it was next to impossible to get the centre stand down, so it has been moved on. Just wanted to share in case anyone else tried to skimp on a cheap lift. The few times I used it I thought I was going to drop the bike. Thanks Bob, you could make some pull away side extensions out of timber and chipboard to make it wider and a bit more secure to load and unload. I put two heavy planks on ether side of the lift so I have a place to put my feet down and side stand so I can get off and pull up on center stand or put a small platform lift under the bike. Yes I dropped a HD ultra classic off the lift once, not pretty. I looked at those lifts when I got my first brick. That RT being so top heavy and clumsy convinced me that a lift would be a very expensive way to work on my bikes. I went to plan B which was to get a chunk of plush carpet about 2mx3m. Park the bike in the middle of it and it's almost like working in the living room. The carpet does an excellent job of insulating me from the cold cement floor in the dead of winter, lets me kneel without killing my knees, and when necessary I can just drop to the floor to crawl under the bike to get at stuff on the bottom. After 4 years working on 3 bikes including two major engine jobs, the carpet is getting a bit funky, and will be replaced this spring. A nice remnant shouldn't set me back more than $30, a lot less than a lift and it certainly takes up less space. 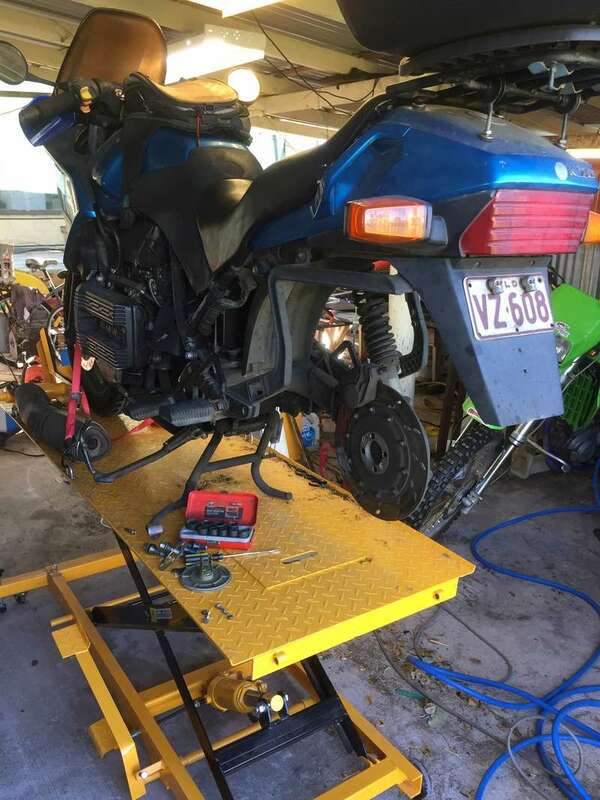 The downside of the lift is certainly the safety aspect of getting the bike on and off the table, but having worked on her for a few hours at height , I will stick with the lift . 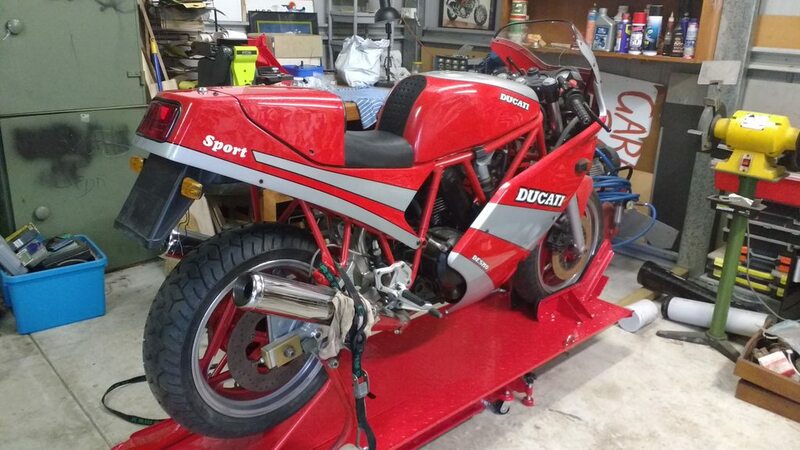 I didnt have a problem getting her on the centre stand, getting her off might be fun though. I will make a platform to fit on the edge of the lift to make things easier..
A more permanent solution will be to cut a rectangle out of the concrete floor deep enough to leave the lift in situ. I hope to extend my K stable during this year, so the lift will get plenty of use. I made my own lift out of a hydraulic hospital bed salvaged from the dump. The extended hose for the OE ram was going to cost me $50.00 Au. So I did a redesign which allowed me to use my garage jack. I made it wide enough to get both feet down and also deploy the side stand. If I want to use the centre stand I clamp and tie down the front wheel. I then jack up the rear high enough to deploy the centre stand, and then lower it down. It is low enough when down to ride the bike on and off. At 70, moving my RT around the garage is an adventure in itself, let alone dealing with getting it on and off a lift. Another benefit of my carpet is the ability to grab an impromptu nap on the sly while doing an oil change. Mine is easy to get on and off as long as you have a spotter. I got overconfident at riding onto the table and didn't have the bikes front wheel centred with the clamp. The tyre hit the edge of the clamp and skewed the front wheel causing it to tip to the right. In order to stabilise it I moved my right foot further out which proceeded to slide off the table. The end result about $400.00 Au. I now wont put it on without somebody centring the wheel and guiding me on. 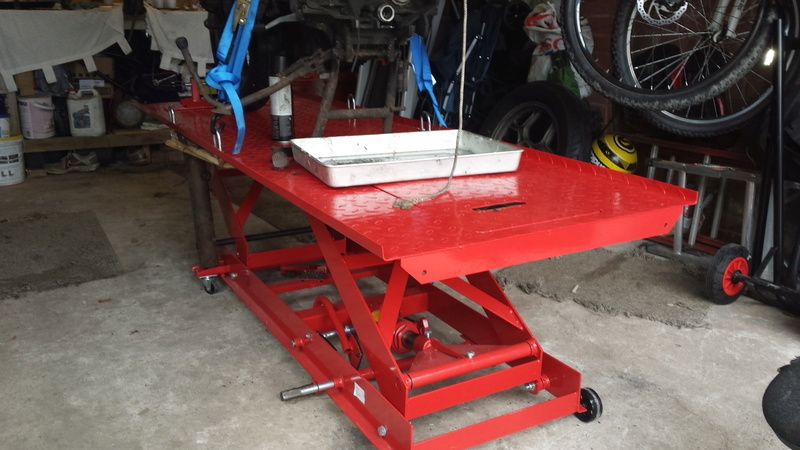 I have a hydraulic lift table. I have a naked K75 so I'm able push it onto the table and down to the wheel clamp. I put some of this traction tape down the tire track for the length of the lift. The bike stays on line as it's being moved. I just roll the bike on then use a rear stand to lift the bike. @Point-Seven-five wrote: At 70, moving my RT around the garage is an adventure in itself, let alone dealing with getting it on and off a lift. 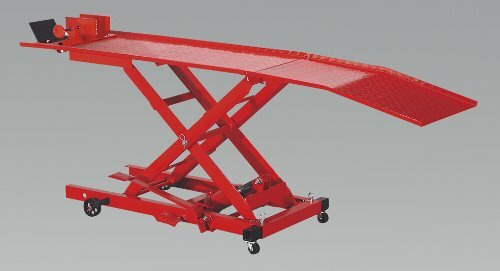 I use a scissors lift , if I put it under the front of the bike I can support the bike, Sometimes winding it to lift the bike high enough to lower the centre stand. I put the bike on a dolly and it allows me to move the bike around on the stand. My LT is too heavy to push onto the lift by myself. I intend to recess my garage floor so the lift will be fit flush . "At 70, moving my RT around the garage is an adventure in itself, let alone dealing with getting it on and off a lift. Another benefit of my carpet is the ability to grab an impromptu nap on the sly while doing an oil change." If you put it into a recess in the floor, be sure to install a drain. Otherwise you will have a bit of a pond under it. A platform on both sides might be a better way to go. I've come pretty close at times. It's a great way to wait for that last drop of oil when I'm doing a change. I have a pile of old towels that are there to wipe down the bikes when I wash them. They come in handy as pillows on those oil changes for this old redneck. @Point-Seven-five wrote: If you put it into a recess in the floor, be sure to install a drain. Otherwise you will have a bit of a pond under it. A platform on both sides might be a better way to go. Dealing with incontinence certainly should be part of maintenance planning. I absolutely love this stand. I walk the bike on by standing beside it with the engine running and drive it on. In this pic, I have actually hung the back wheel over so I could remove it without any trouble. 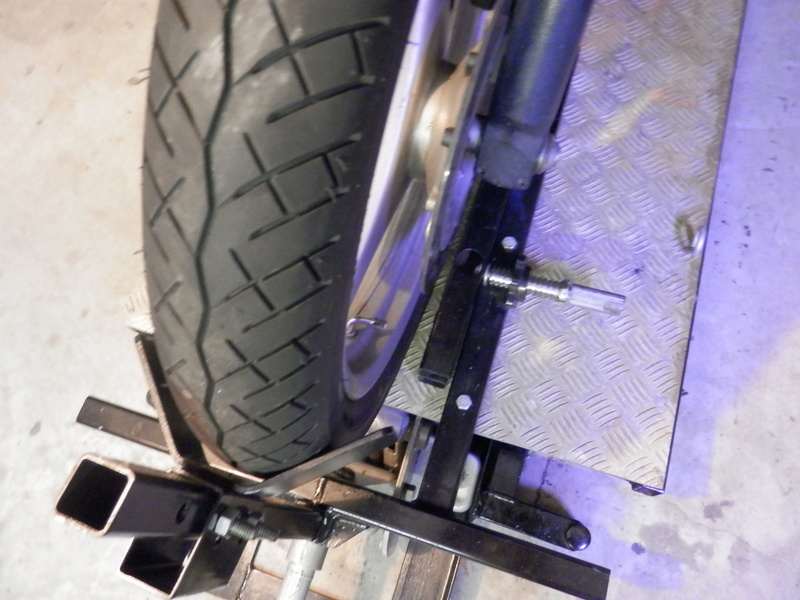 I have used tiedowns for extra stability, positioning them so the bike can't roll forward off the stand. The actual steel parts of the lift are very strong, but the small components are crap. I sheared off a bolt adjusting the raise lever, luckily only a spacer, and the lowering lever is a bad design. I had the ram replaced under warranty as well. My intention is to put an air ram on it, so the basic unit being heavy duty was my main concern. » What is best way to lift your lawnmower?